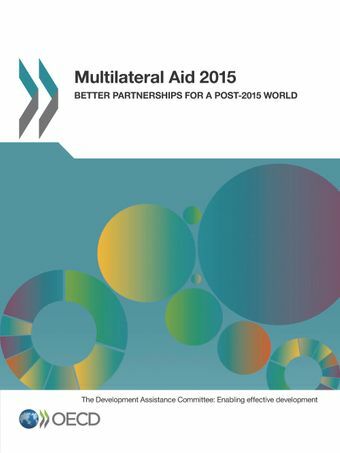 This 2015 OECD report on multilateral aid contributes to the broader debate on how to implement the post-2015 development agenda. It argues that multilateral organisations have a fundamental role to play to forge and strengthen inclusive partnerships that will provide the collective, cross-border solutions needed to eradicate absolute poverty and foster a new era of economic progress, environmental sustainability, and peaceful and inclusive societies. But to be fit for purpose, multilateral organisations will need to implement a challenging reform agenda to both address the unfinished business of internal changes and respond to a fast-changing global environment.Multilateral Aid 2015 identifies how bilateral providers can support multilateral organisations in implementing the necessary changes and fostering effective partnerships that (i) make best use of all resources available for development, including earmarked funding, and (ii) leverage knowledge and resources from partners beyond the “traditional donors”. Global pooled funding mechanisms and other instruments to earmark funding: how effective are they on the ground?